Another bushel of downloadable content hit Injustice: Gods Among Us this morning, offering players new costumes, new missions and a brand new fighter. 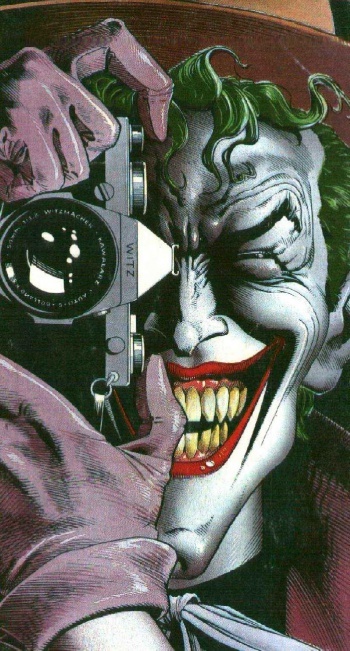 In 1988, noted living beard Alan Moore wrote a Batman story called The Killing Joke for DC Comics. In this tale, The Joker shoots Barbara "Batgirl" Gordon in an effort to strike at her father, Commissioner Jim Gordon. This lands Ms. Gordon in a wheelchair for years, and she loses the ability to fight crime as an acrobatic member of Batman's inner-circle (though it's probably more traumatic that she lost the ability to walk). I mentioned the above as today's DLC offerings for Injustice: Gods Among Us stem largely from that story. Most crucially, we have Batgirl herself (the ambulatory version). If you purchased the Injustice season pass you'll be able to download this new fighter for free once you've fired up the game, but if not you'll need to shell out $5 for the extra content. Likewise celebrating Moore's genius is the Killing Joke skin pack, which offers two new skins for The Joker, and one for Batman. The former receives "Red Hood" and "Tourist" aesthetics, mirroring both his (possibly fictional) origin story as presented in The Killing Joke, and allowing players to dress up as the gaudily-clothed Joker who shot Barbara Gordon that one time. Batman, by contrast, receives what is described as a "Classic" costume, based on his look in The Killing Joke. As with all of the Injustice skin packs, the Killing Joke bundle will set you back $3. Today's bounty doesn't end there though. Those of you who didn't pre-order Injustice from Gamestop will be happy to see that the previously "exclusive" Red Son DLC pack is now available to anyone willing to drop $3 on the pack. Not only does this DLC include three new Soviet-themed skins for Superman, Wonder Woman and Solomon Grundy, it also adds an additional 20 STAR Labs missions, bringing the game's total to nearly 270. Finally, developer NetherRealm Studios has also decided to gift players with yet another gratis skin in exchange for downloading the latest Injustice compatibility pack. See, the compatibility pack ensures that everyone playing online will have access to all the same data, thus it's important to the longterm health of the game's community that everyone be on the same page. While this pack is free of charge, NetherRealm wants to make sure that everyone grabs it tout de suite, and as such has included a free Luchador skin for Bane with the compatibility pack. In sum, you put no money down, your game gets updated to the latest version, and suddenly you've got a bit of new content. If history is any indicator, we should expect word on the next DLC character headed for Injustice very soon. Batgirl was revealed only days after Lobo's release, so odds are solid we won't have to wait a month for NetherRealm to acknowledge whoever it's planning to add to the roster next.